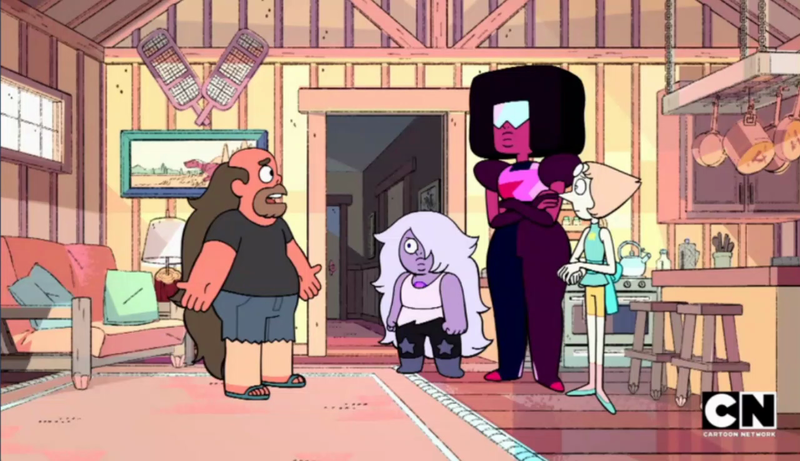 Oh hey, looks like we have a new storyboard artist coming in! And we haven't finished up with Lauren Zuke episodes either! 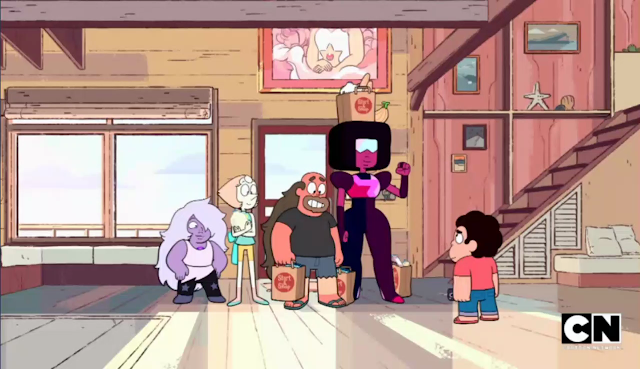 Two nice surprises and the episode hasn't ever started. 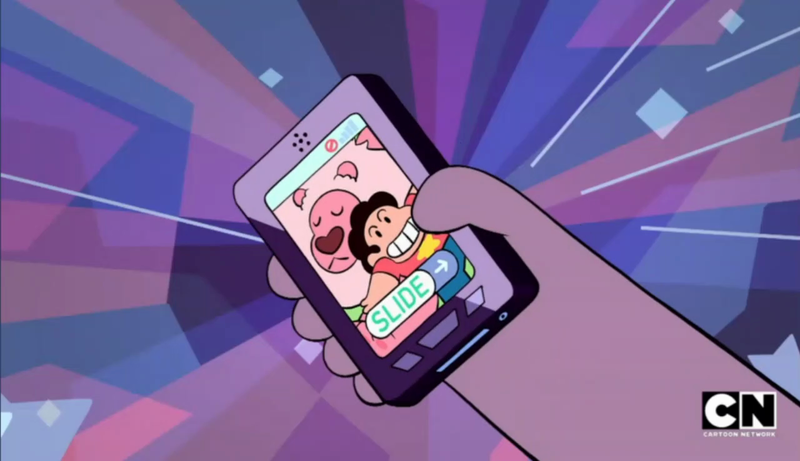 I mean, if Connie was as out of it as Steven was this episode, she could have gotten her phone mixed up with a tennis ball. Well uh... I guess that's one way to solve the problem? 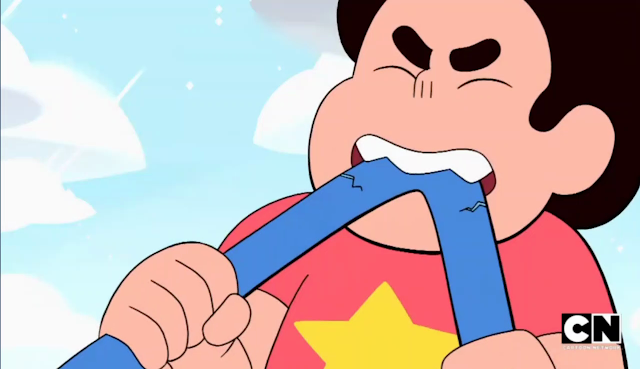 Man, I wonder what Steven's jaw strength is like. Do all gems have massive jaw strength? 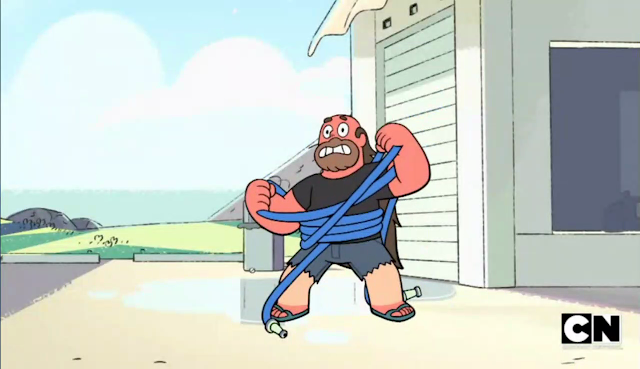 Oh joy, it's everybody's favorite Beach City citizen! 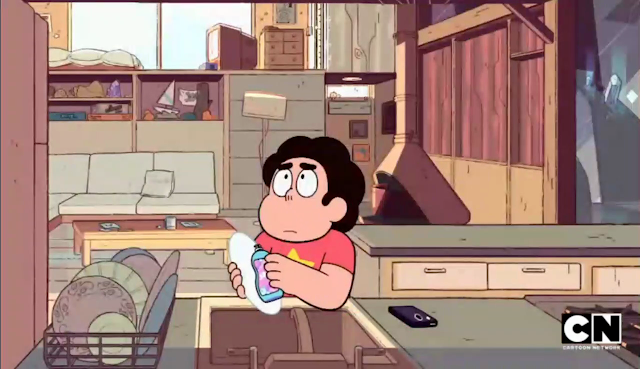 Steven that's not... 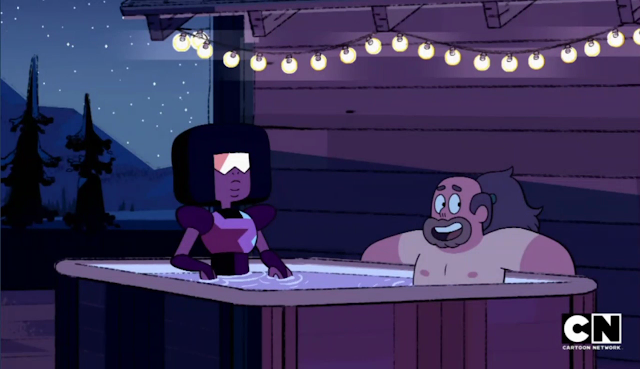 The water's not even on. What are you? RONALDO NO SPOILERS! 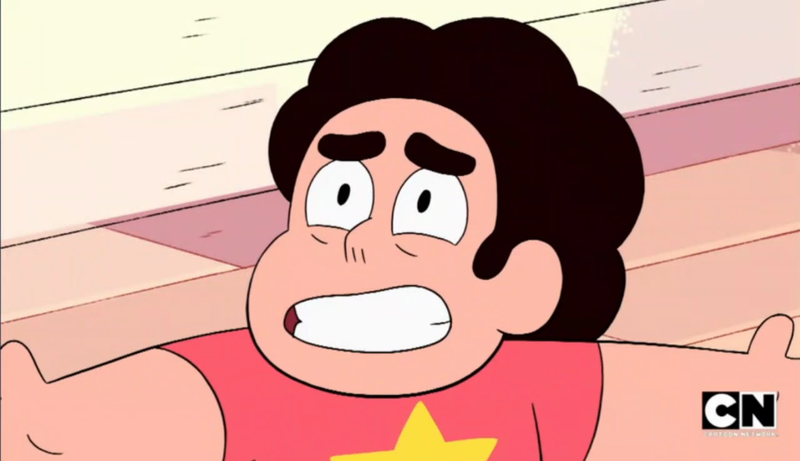 We're only on episode 2 of the bomb! 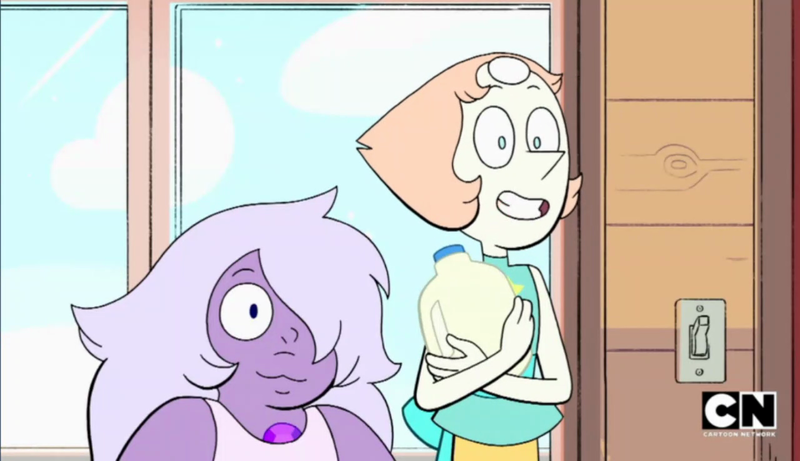 I really don't know where this joke is going. 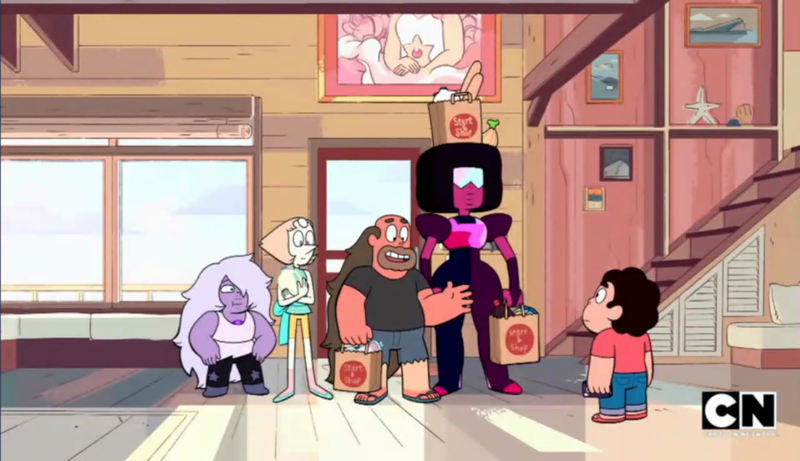 "It's farm fresh." 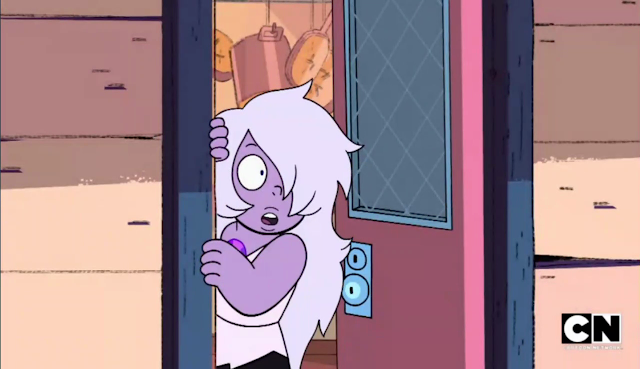 So what are you implying, Amethyst?! 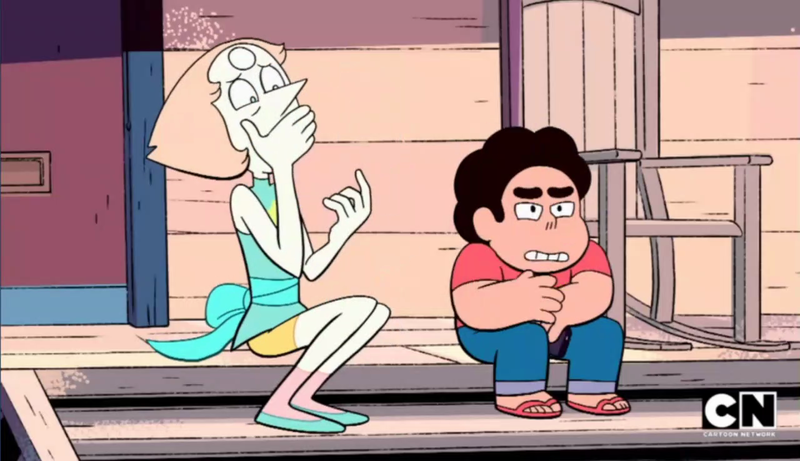 Steven knows how we feel about this scene. 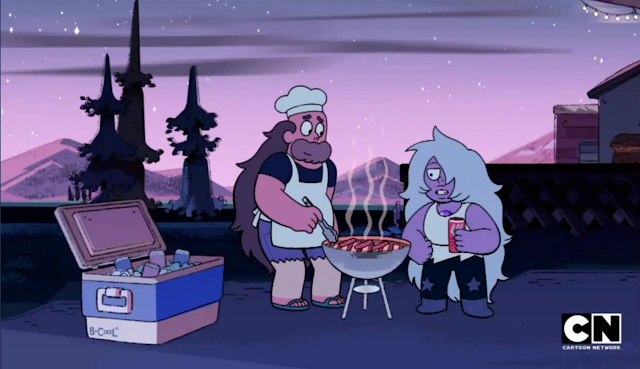 "How often are we on the same planet together?" I mean... for the last 14 years? 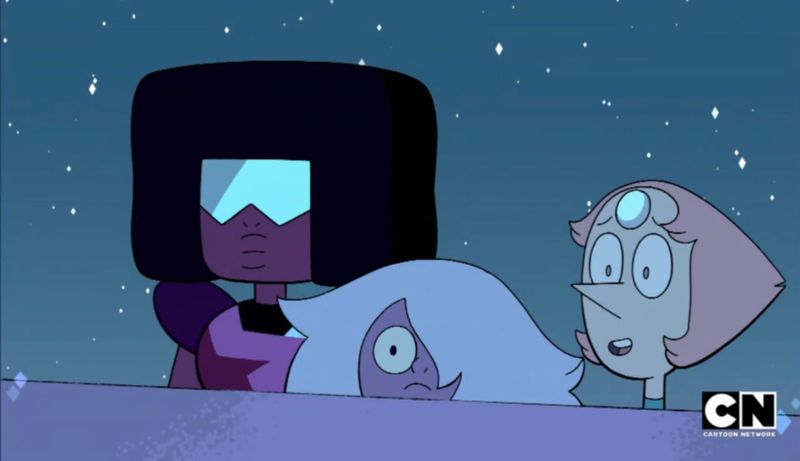 Did you all get the feeling that Ruby and Sapphire were having an internal monologue about what to do in this situation? 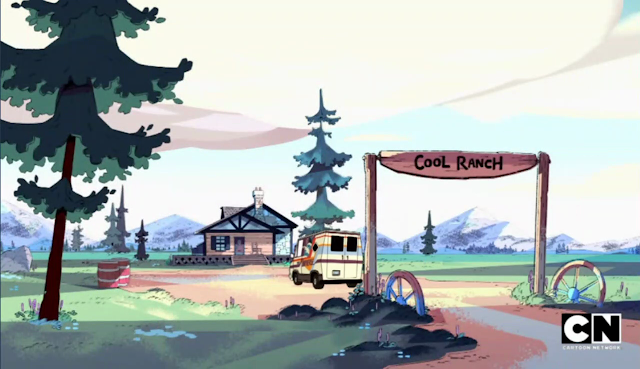 Yeah, that'd make me go on a vacation too. 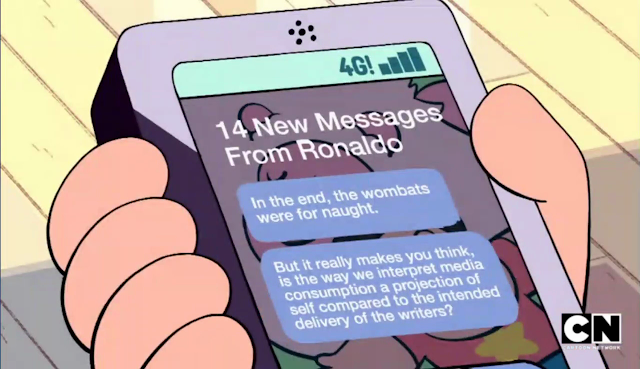 Also wait did the SU writers get a bit meta with that last message?! 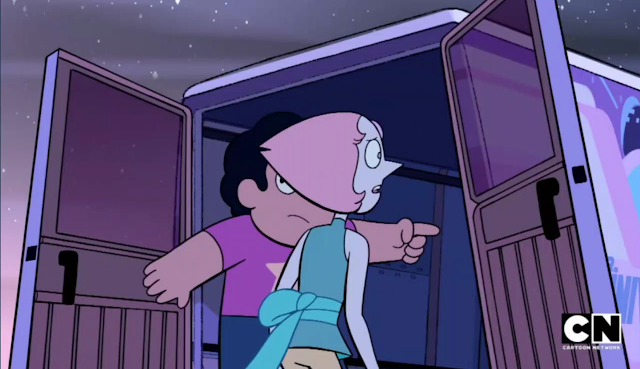 "Aced it!" 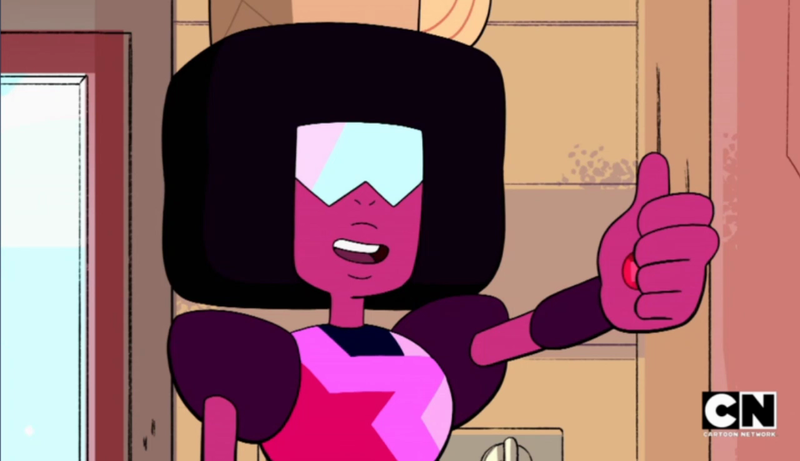 Nice job, Garnet! Is this a subtle advertising campaign? Party Boy in the house! "She'll be okay." 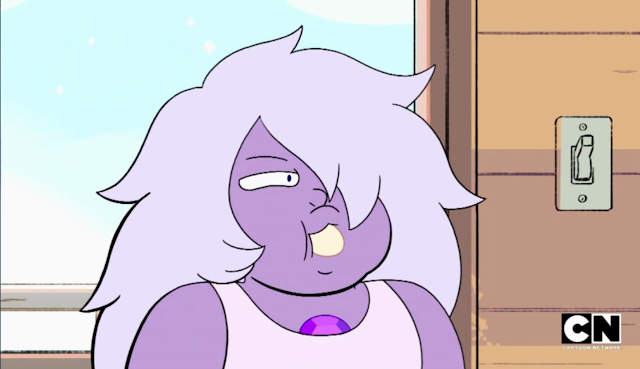 Yeah, I mean, Amethyst survived eating a 5 year old burrito. "It isn't the pain. 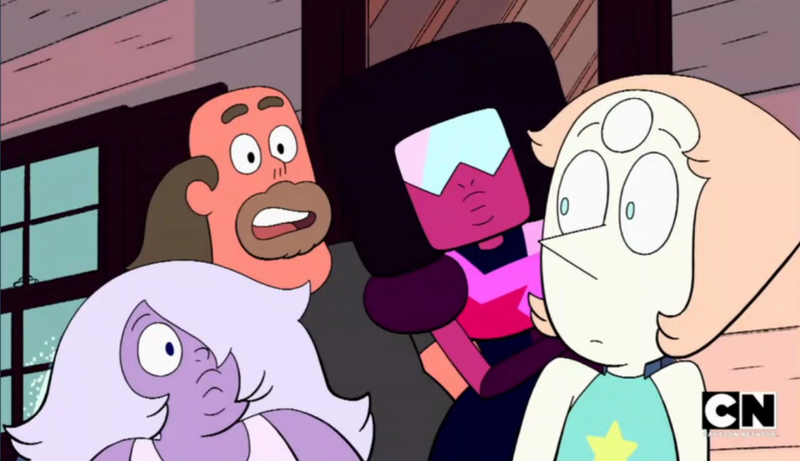 It's the surprise." 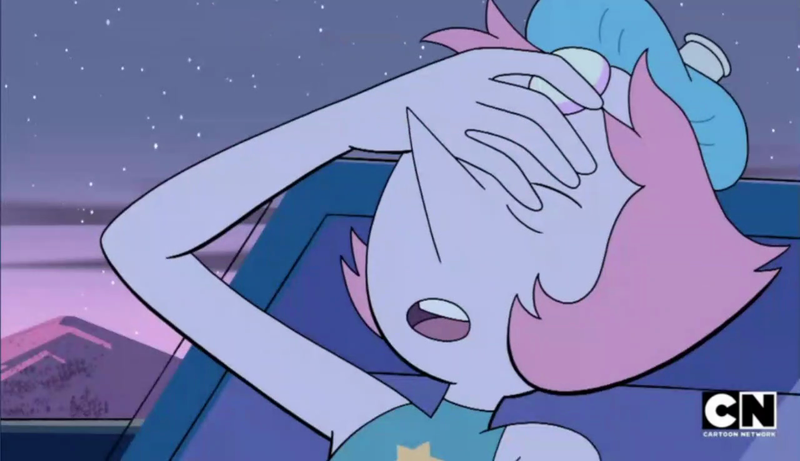 There's that dramatic Pearl we've all missed! 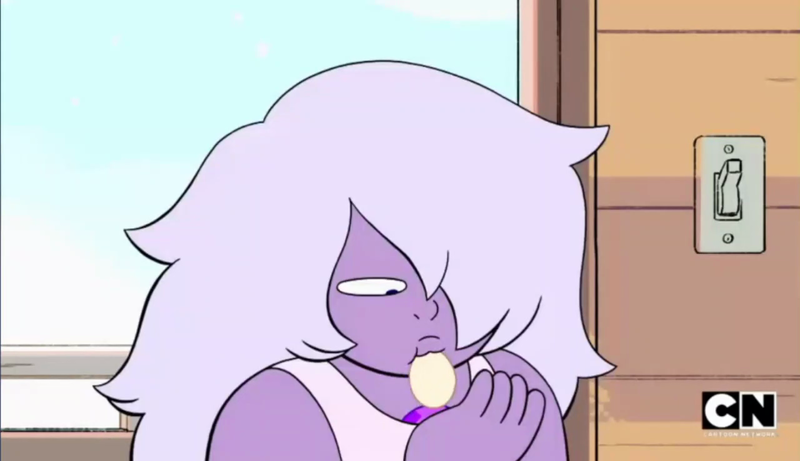 Amethyst actually gave some pretty good advice. "It's okay if it isn't okay." 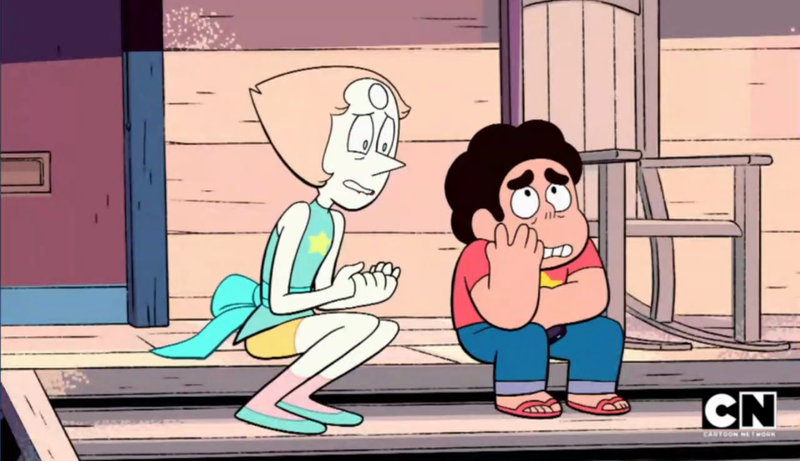 I think she's showing a lot of maturity here and becoming an adult figure that Steven can look up to! 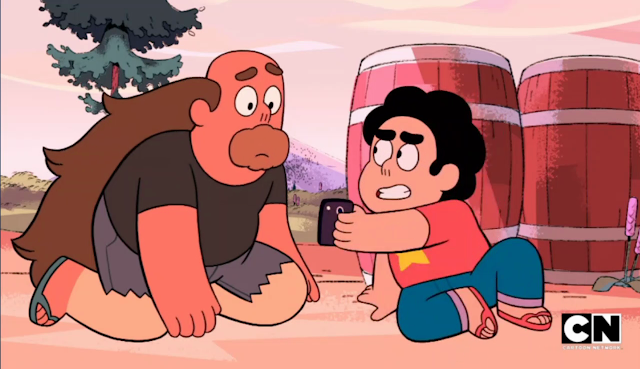 Yeah character development! 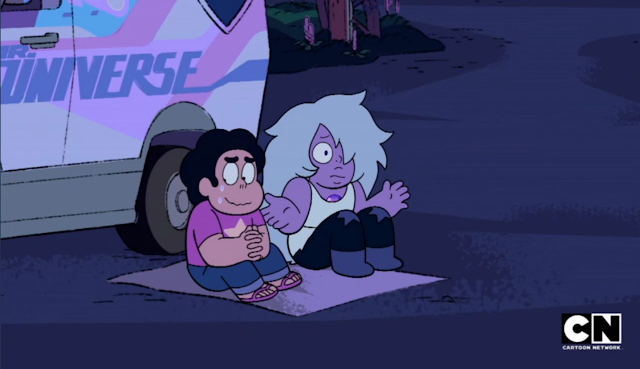 But even Steven isn't opening up to the chillest gem. When Steven realizes his clothes are still on. "Pink Diamond was ravaging the planet-" Well, I guess that's the end of that story! 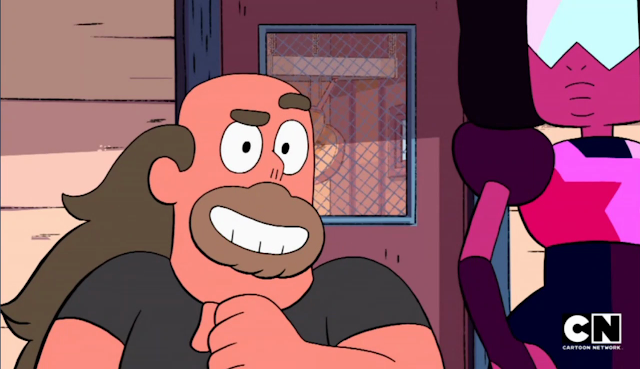 Thanks Steven! 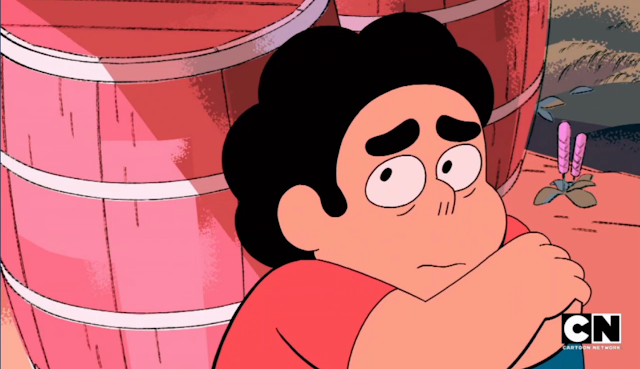 TFW you still can't fully relate to your half alien son. 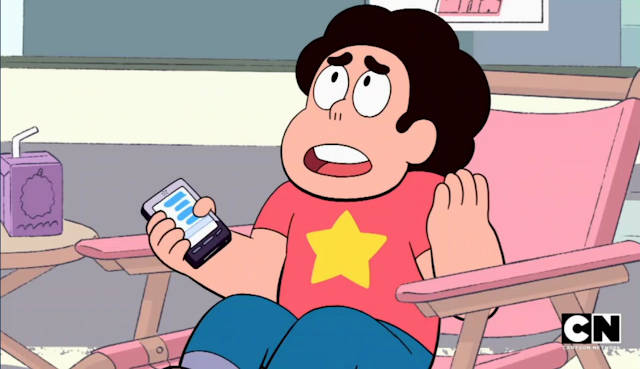 Hey like how come Garnet couldn't see why Steven was upset? "Dramatic experience." 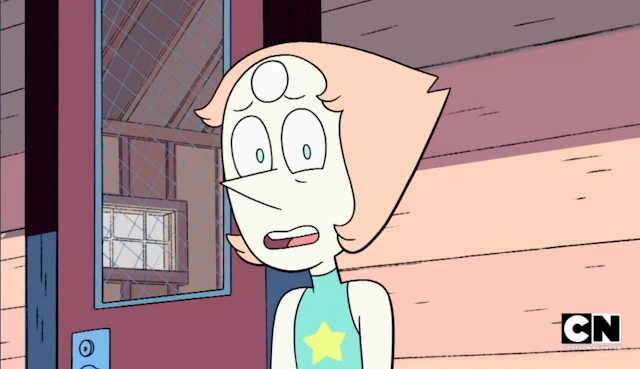 YEAH MAYBE A LITTLE BIT PEARL. "I'm sure you have a lot of questions you'd like answers to. 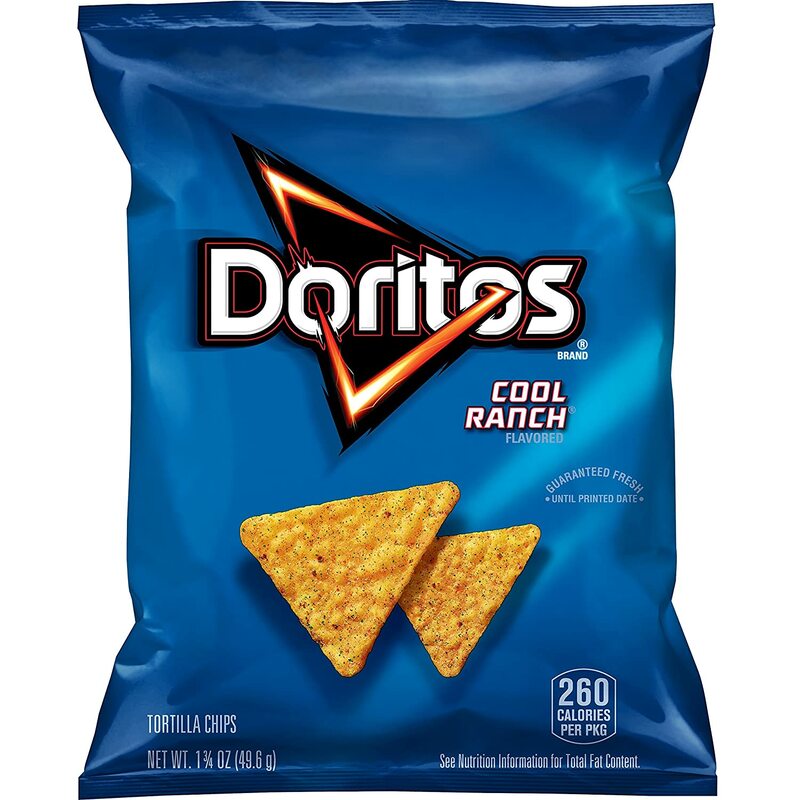 Like about the Diamonds, for instance." WELL PEARL I KNOW WE ALL SURE WOULD! Hey uhhh this scene is getting a little weird like someone is forcing Pearls hand and not allowing her to talk about things. This feels almost like something we've seen before. Like she's really trying to remove that hand. 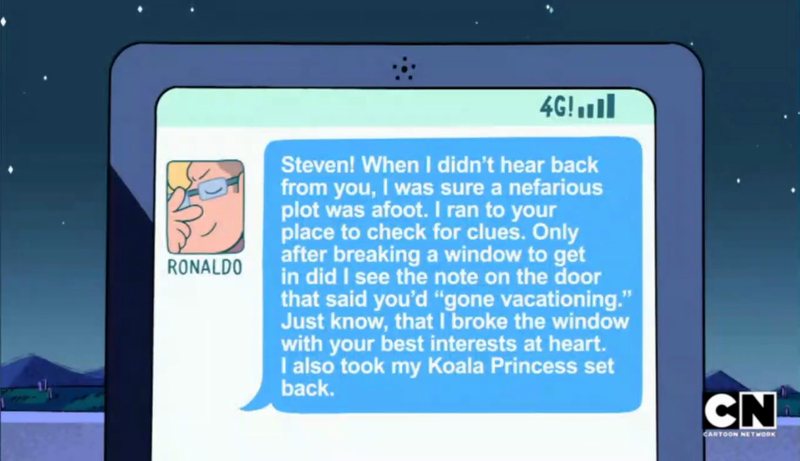 Look at this whole thing! AND THIS! This has been a long ongoing thing. 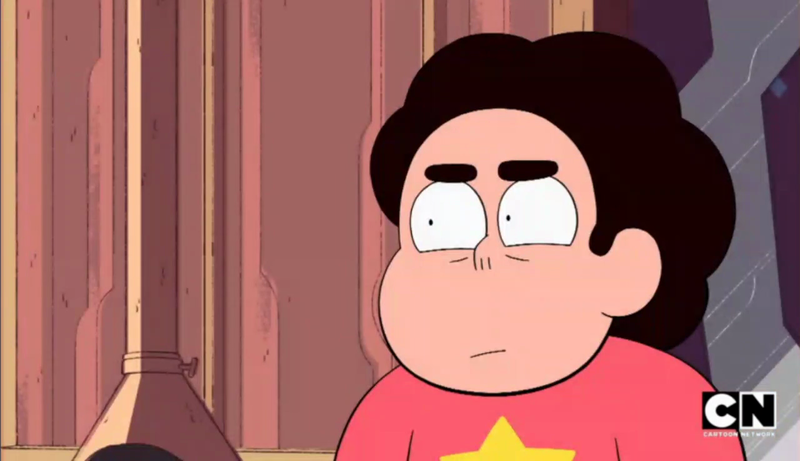 Like what is up with that? 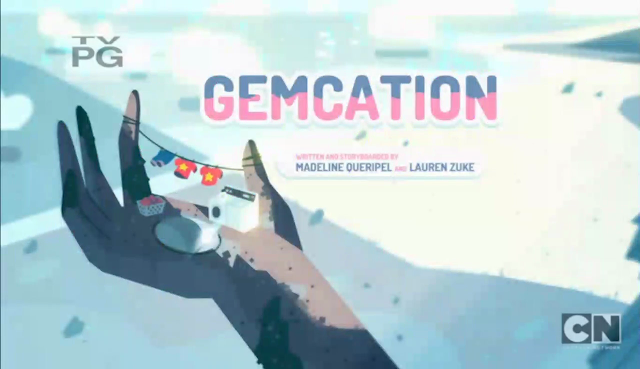 Has no one noticed or do the other gems just ignore it? 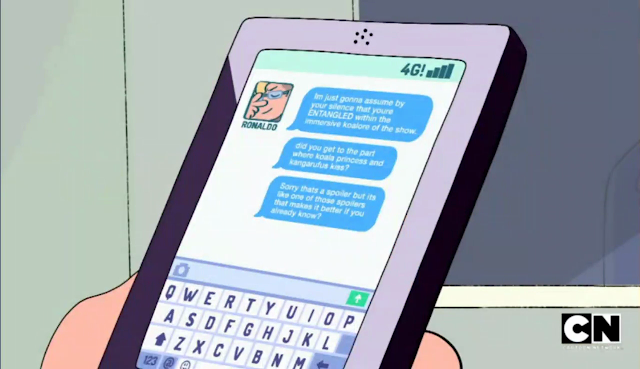 What can't Pearl say? Is Steven not going to say anything about how he's never heard her origin story but does know Amethyst's and Garnet's? We weren't listening but were conveniently right inside the door within earshot. 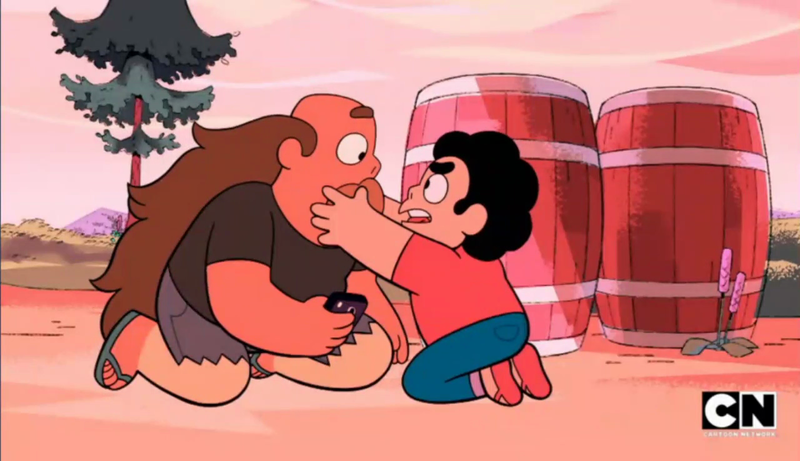 Well, I guess Steven learned one thing from the gems - how to not talk about your feelings! 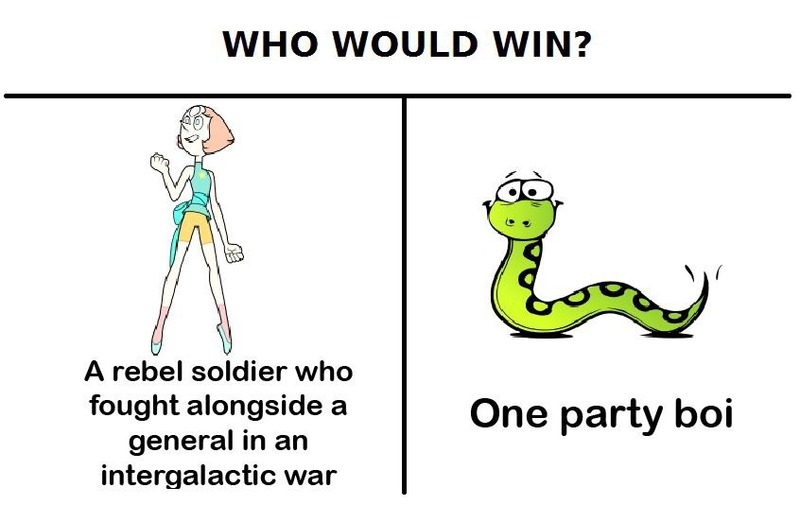 WOO! Greg to the rescue! 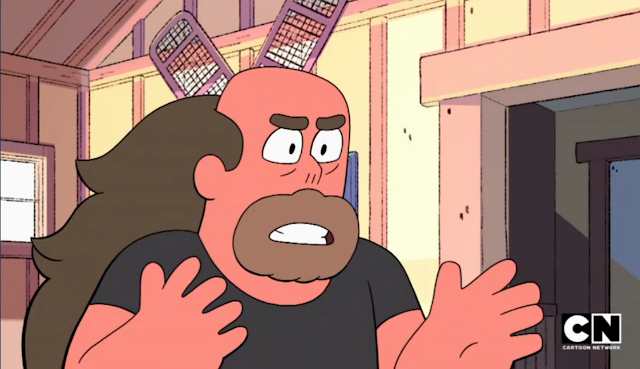 I wish he was my dad. 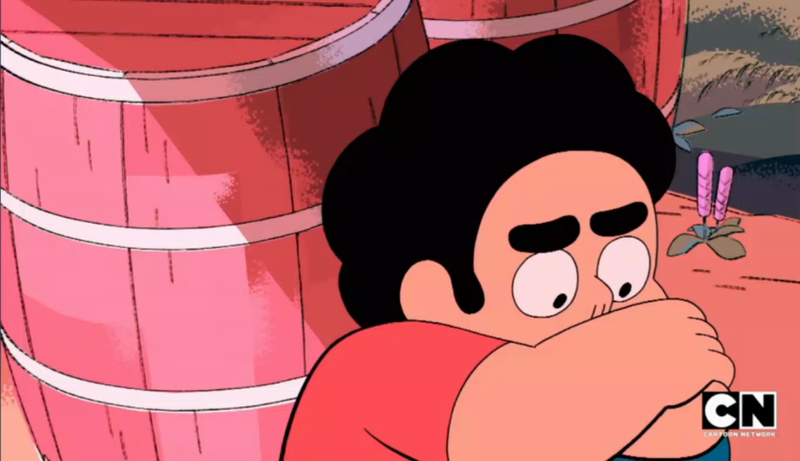 That IS a very Steven shaped barrel. 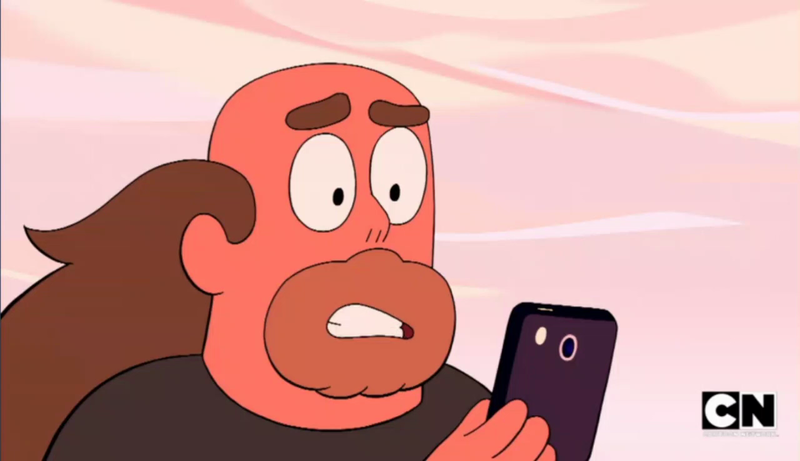 Hey Steven. 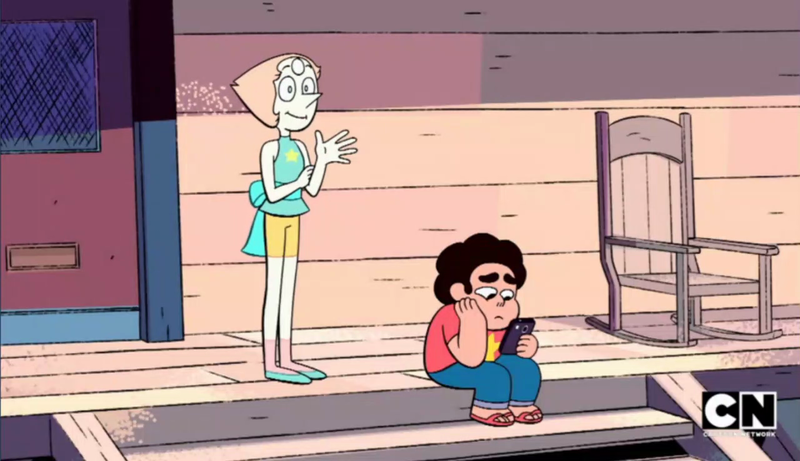 Maybe you hurt everyone by turning yourself over to Homeworld and everyone's just coping differently. Like how the gems won't let you out of their site or how Greg took you on a bonding vacation. 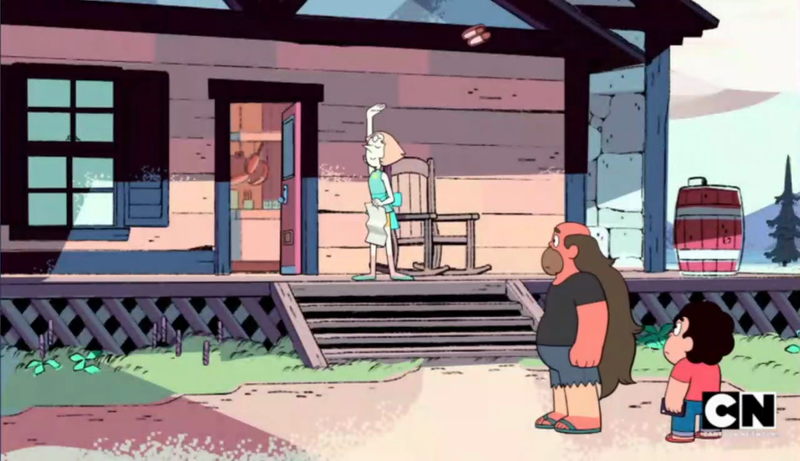 Connie's not the only one acting weird here. 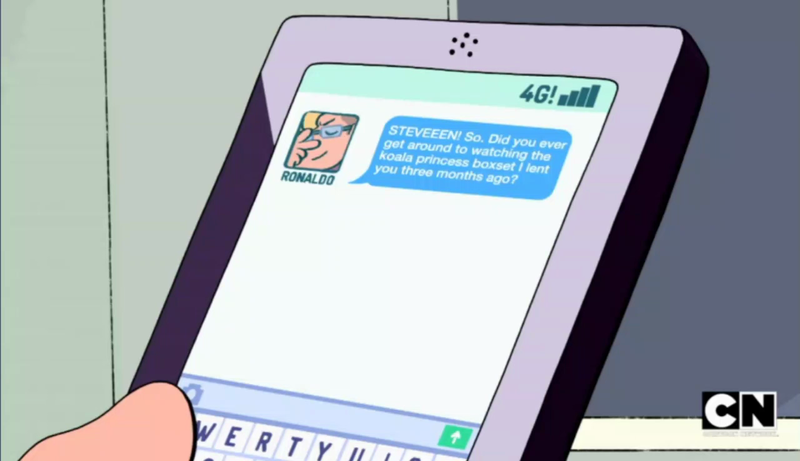 Dad, can you believe Ronaldo keeps texting me about this Anime? 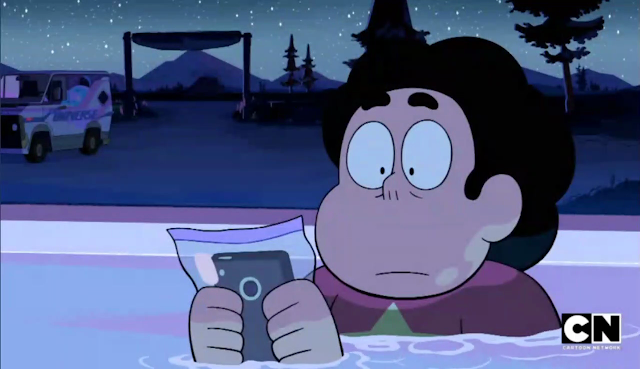 I can't believe Steven was staring at his phone the whole time and didn't realize he didn't have service. He was really, really out of it! 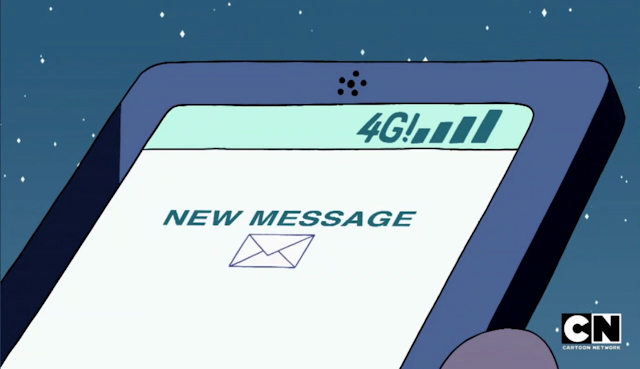 You millennials and your phones and always needing service. Pearl still never has any idea what's going on. AWWW LOOK AT THAT BACKGROUND! Yeeeessss finally we'll hear from Connie! 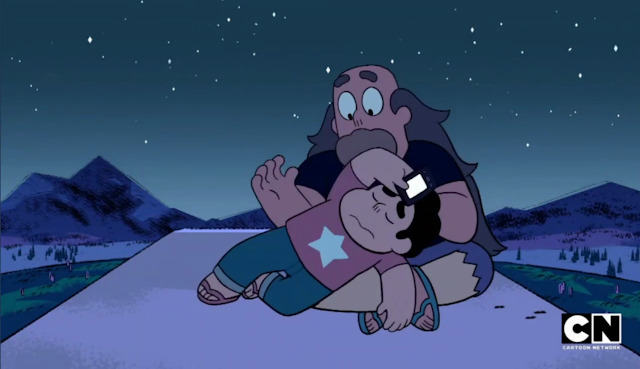 Where'd you get that dramatic pose from, Steven? You taking lessons from Pearl? 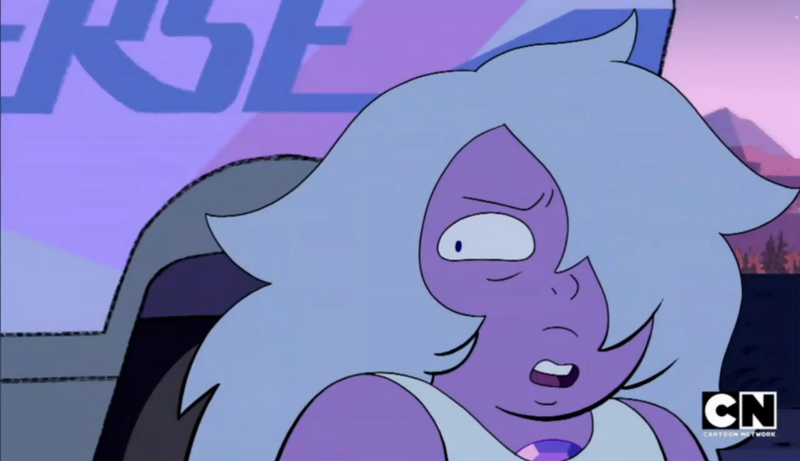 Huh. 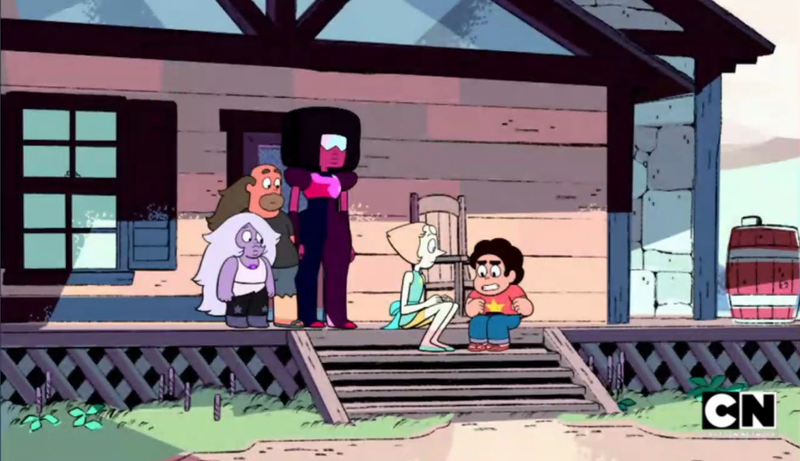 Has it been awhile since Steven had a normal human type problem? 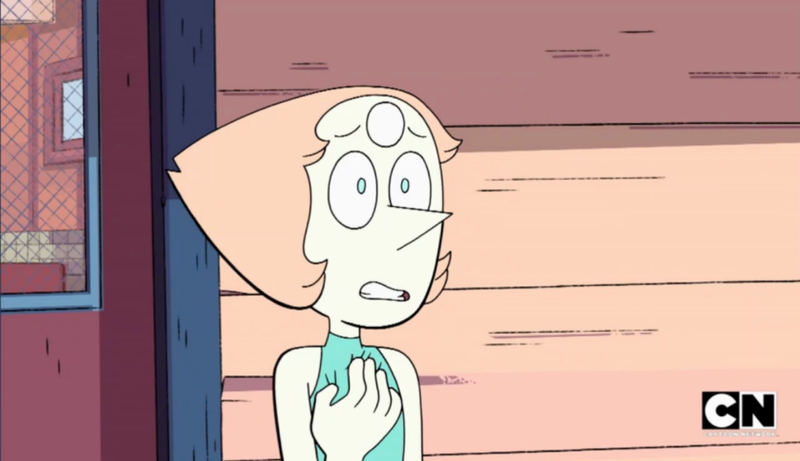 Sometimes it can be really hard to juggle the past transgressions of your mom and maintaining healthy relationships. 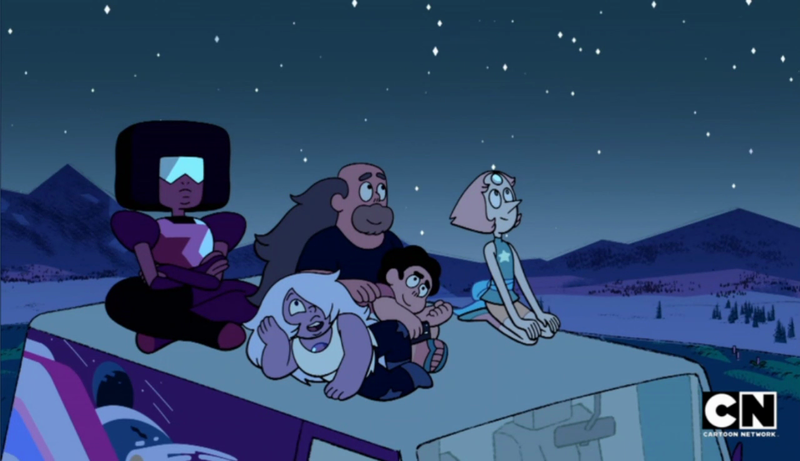 Look at these guys! They're adorable! 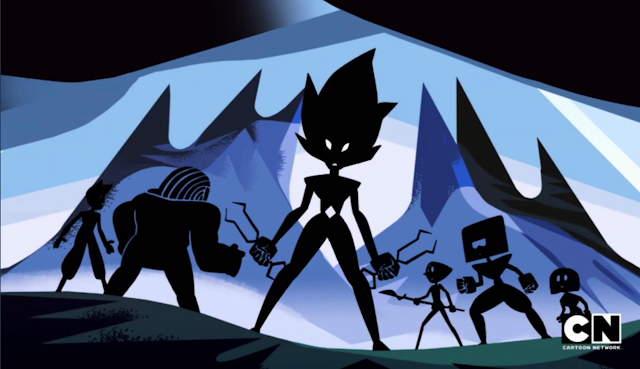 The family's all back together again and the Earth is safe for a few more moments! All in all, a very nice episode! We got some more weird Pearl stuff and didn't learn anything more about Homeworld. 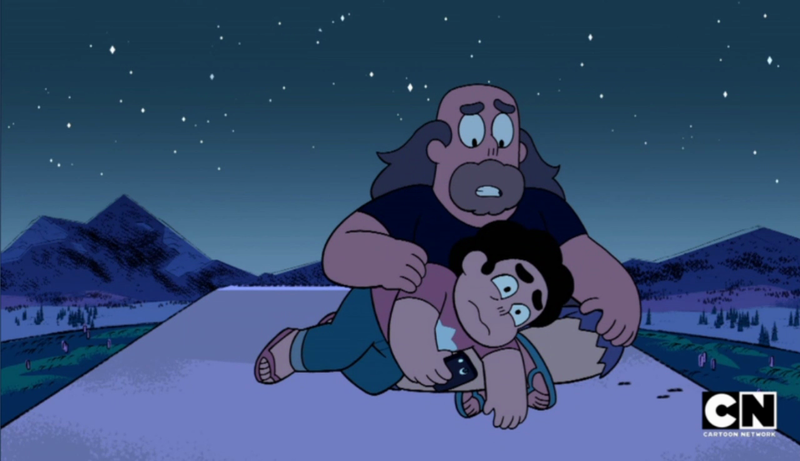 But, this is a great example of Steven having to deal with stuff that isn't all just fighting gem monsters or the rulers of Homeworld. It's him dealing with a normal human thing. Because he is still human. No matter how much he tries to pretend to be his mom. A gem is only part of who he is. And gem problems aren't the only ones he has to deal with. I guess if Steven's grounded to Earth and the gems barely let him out of their site, it's time for him to just be a regular kid again. 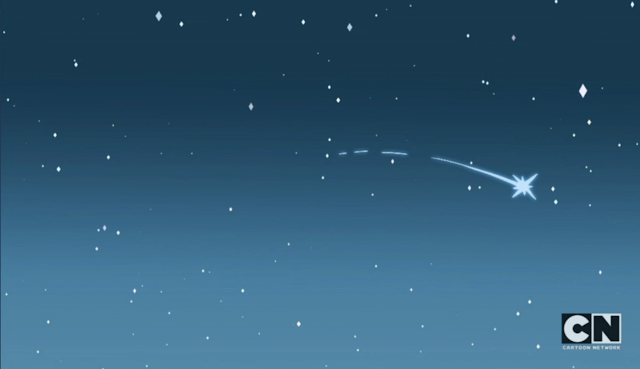 For a little while, anyway.